Sanborn maps have a certain elegance, no? I have a lot of links for you today, with just a little background, and a little diatribe. 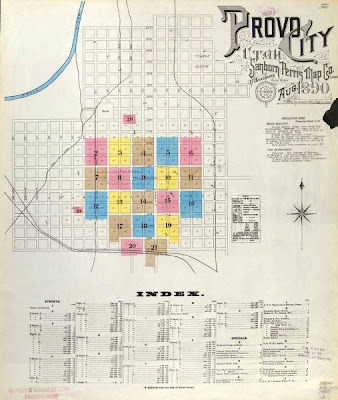 Sanborn Fire Insurance Maps were drawn up for many cities and towns in the late 1800's and early to mid-1900's. They are wonderful sources of insight and detail on how and where your ancestors lived and worked. The maps list almost all buildings, streets, places of work, parks, schools, many residences, and town/city layouts. Maps from different years show changing street names, boundaries, and land use. You even get to find out if a factory had sprinkler systems, elevators, and was made of brick, wood, or stone...the maps are that detailed. A fair number of Sanborn maps have been digitized, and are available in free online collections. That's the good. The collections are sometimes infuriatingly difficult to browse, with very large maps being made available a small window at a time, with limited panning and zoom tools; that's the bad. The maps are never ugly, however...quite the opposite (I just wanted to throw ugly in the title). So without further ado, here are some links to online, free collections of Sanborn insurance maps (and maps from a few other sources, as well). There are many more such maps in hardcopy and microfilm collections; check with your community library or town/county historical society for local resources. Virtual Library...thanks! Added 'em to the list. There are some Illinois Sanborn maps here, and Montana ones here. Hawaii has the Dakin Fire Insurance Maps here. Miriam...you are GOOD! Thanks a lot, and happy new year. Today getting help with that small extra need for cash is easier than ever.Online cash loans are for anyone who needs to borrow funds and is not limited depending on credit.So if you find yourself short of cash and need that "little extra" consider an online cash loan. How about GUTS? Nah, just kidding. You really don't need unbridled courage to be a successful online income affiliate. But, how about SKILL? anything else today, online income acquisition demands that you have specific attack plans for your advertising campaigns. Keywords are the life blood of online income affiliate advertising and sales.SMARTS - that's the name of today's online income affiliate game. in your online income affiliate endeavors. Kansas maps are available at the University of Kansas. Thanks, Robin...link has been added. Thank you for the link – am adding it to my other favourites from the Library of Congress American Memory Map as well as University of Texas Perry-Castaneda Library Map Collections. They are the jewels of the treasure trove, and I cannot emphasize how important these maps and archives are for the future generation. Record keeping should be made a duty for everyone, particularly at times like ours where we travel more extensively either for leisure or for the purpose of moving out of our homes to settling down in foreign lands.